Quality Service and Quality Products…the foundation of this Family Owned business! Safari Signs customers have come to rely on our team of dedicated professionals to consistently deliver “Big City Service with a Small Town Smile!” It is this dedication towards our customers that has resulted in exceptional, continued growth of the company. We are a company that still takes pride in exceeding our customer’s expectations while keeping up with technology in an ever changing and challenging industry. From Cut Vinyl Graphics to Full Color Wide Format Digital Printing; Window Graphics to Dimensional Signage; Vehicle Magnets to Vehicle Wraps; Business Cards to Letterhead to Logo Design; Table Top Marketing Displays to Trade Show Booths, Safari Signs is a One-Stop Shop for your Visual Image and Signage needs! 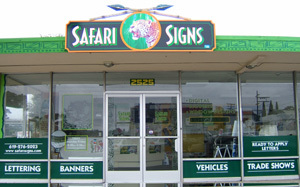 What really sets Safari Signs apart from the rest is the CAN DO attitude of its owners. Driven by this positive attitude the Safari Signs team will find a way to solve your signage problems and make it happen in a timely and economical manner.